Have you seen this dollhouse? 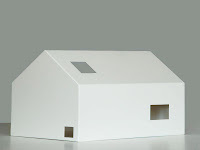 How exciting that someone designed a 1:18 modern dollhouse in lacquered steel material. However, I’m disappointed with its design. It looks very…boring. And it is from Sweden so I’m confused about how boring the design is. There are only 100 of these signed limited edition dollhouses. The cost is roughly $250 via scandinaviandesigncenter.com. Looks like a toolbox or a breadbox. Maybe they based the design off of what could be easily manufactured in steel thus the blah.